Kids, Let's Go Fishing – Providing Kids with Fishing Opportunities. The Reward Fishing Fleet in conjunction with the Florida Fish and Wildlife Conservation Commission (FWC) and International Gamefish Association (IGFA) offers to teach students “how to fish” and in doing so develops their appreciation for the renewable marine resources and coastal marine ecosystems. This program combines educational components with interactive hands-on participation. 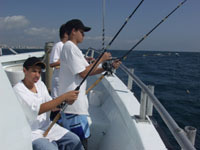 The Reward Fleet uses one of its vessels as a floating classroom, taking groups of children and adults onboard for a unique, educational fishing experience. An introductory lecture will be provided by an IGFA or other qualified instructor. 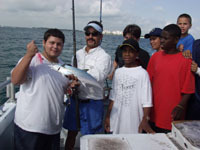 The fishing experience will be provided by an experienced Captain and crew who will teach the students about fishing rules and regulations, fishing gear and how to use and take care of it, the use of artificial and natural baits, proper handling and releasing of the catch, safety precautions with hooks and lures, and proper casting procedures. While fishing, ongoing instruction with the students will focus on the identification, anatomy, biology and ecology of the fishes caught, and how this information relates to the rules and regulations in place to conserve the species and protect their environment. “Kid’s Fishing Clinics” from the Outreach and Education section of the FWC. To get kids outside, in a safe, fun-filled and stimulating environment where they can experience both a unique activity and learn enough about the sport, the fish and the marine ecosystem to develop an appreciation for conservation of renewable marine resources and ecosystems. To create awareness in the children of the vulnerability of the marine environment and its resources to misuse, overfishing, and the importance of conservation. To teach ethical and safe angling skills, and provide a foundation for the students to build a better understanding of fishing, fish and their environment. This general outline describing a typical trip is open to any alterations or specific needs of our clients and sponsors. The management of the Reward Fishing Fleet is willing to customize the perfect outing, meeting costs and goals acceptable to all parties. We strive to make this an educational, fun, and economical experience for all involved.